Kenya's Vivian Cheruyiot shattered the course record at the Lisbon Half Marathon on Sunday in Portugal. In the men's race, won by Ethiopian Mosinet Geremew, 14 runners finished in under 1:01. 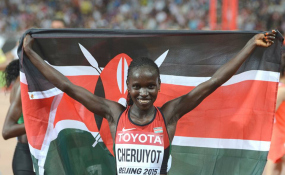 On an almost perfect day with just some slight winds for the runners to contend with, Cheruyiot, the 2016 Olympic 5000m champion, ran on her own from the 10km point en route to her 1:06:34 victory. The 35-year-old improved her personal best, a 1:07:43 performance set at last year's Great North Run, by more than a minute. Elsewhere, World Half Marathon record holder Joyciline Jepkosgei is the new champion for this year's New York Half Marathon held on Sunday. The athlete, who trains in Iten, Elgeyo Marakwet County, took the lead after cutting the tape in 1:10:07 ahead of her compatriot Mary Ngugi Wacera, who clocked 1:11:07 as Ethiopia's Buze Diriba settled for the third position in 1:11:07. The athlete broke away from the leading pack after 10km and led all the way to the tape. "I'm happy to have won in the race and this shows that I'm on the right track as I prepare to participate in my first marathon. I'm really excited and waiting for the race as I continue preparing," she told Nation Sport on phone from New York. In Seoul Marathon, it was a clean sweep for the Kenyans after Thomas Rono won the race in 2:06:00 ahead of Elisha Rotich, who ran in 2:06:24, while Mike Boit sealed the podium three in 2:06:24. Celestine Jepchirchir was third in the women's category after she clocked 2:24:48 behind Ethiopia's Hirut Damte, who clocked 2:24:10 in a race won by Desi Mokonin from Bahrain in a time of 2:23:45.